Are you going to approve this request? Joe, a new hire, is one of your most knowledgeable sales associates. Ask him any question about your products and services, and he can practically quote you the information verbatim. The golden rule that one size fits one is key to designing high-impact training and development. The modern-day team performance acceleration efforts often fail, with no lasting value, due to the overly programmatic nature of the training effort. Organizational mentoring has gone online, following the path of many other processes over the last couple of decades. But is that a good thing? 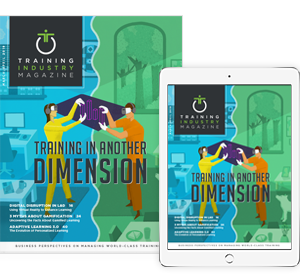 This edition of our magazine explores a couple of key concepts dogging many in our industry: the role of L&D in culture change and the role of the manager as a change coach. As a mentee, gaining insight from someone with more experience is a surefire way to reach your professional goals quickly. But what do mentors get out of it? Beth Comstock, vice chair at GE, recently emphasized that we live in an emergent era. The emergent organization is one in which culture, social relationships and decision-making processes are constantly in evolution. As far back as the medieval era, training a new generation of workers was done via on-the-job training accompanied by some form of classroom instruction. The workplace is shifting from a top-down management model to a culture of leaders who can influence and impact change across the business. Nearly 70 percent of companies’ budgets are dedicated to human capital costs, according to Human Capital Management Institute. F5 Networks (FFIV) is a Seattle-based technology company. With 4,395 employees and 620 managers worldwide, we believe that strong management leads to increased employee satisfaction, increased retention and an overall stronger performance. It was still dark at 5:30 a.m. with a light drizzle falling on the 29,000 runners making their final mental preparations to navigate the windy 13.1 to 26.2-mile course.